Score from 127 reviews: Good 7.8 1 person is looking at this guest house. Rooms at the Termes Hostal are brightly decorated and feature a flat-screen TV and telephone. Some rooms come with a terrace or balcony. Hostal Termes has a terrace where guests can sunbathe. The guest house is situated close to many restaurants, bars and shops. The Termes is less than 500 metres from Sitges Train Station. The Club del Golf is around 3 km from the guesthouse. Barcelona Airport is a 35-minute drive from Sitges, and Reus Airport can be reached in less than an hour. Score from 139 reviews: Fabulous 8.6 1 person is looking at this guest house. Housed in one of the town’s listed buildings, Boutique Hotel Davallada is less than 5 minutes’ walk from the beach. Boutique Hotel Davallada’s beautiful rooms include original 19th-century features, such as stone archways and beamed ceilings, combined with attractive décor, antique furnishings and art work. All rooms have air conditioning, a flat-screen TV and free Wi-Fi. Guests receive a bottle of wine on arrival. 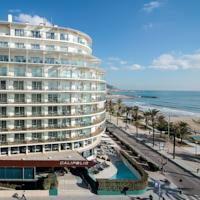 Some rooms include a terrace overlooking Sitges or the Mediterranean Sea. Bars and cafés can be found in the surrounding old town. There are several popular restaurants set along the seafront. Sitges Railway Station is just 5 minutes’ walk from the hotel. There are regular trains to Barcelona, a 30-minute journey away. The apartments have a lounge area with a flat-screen TV, and free Wi-Fi access is available. Each one has a kitchen with an oven, microwave and washing machine. There are many shops and bars in the streets around the apartments, and the lively Dos de Mayo Street is just 230 metres away. 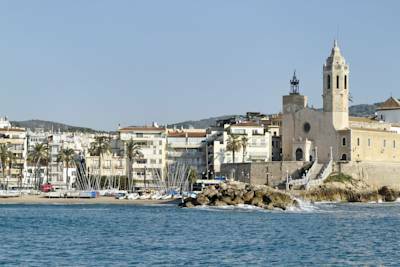 Located an 8-minute walk away, Sitges Train Station takes you to central Barcelona in around 40 minutes. The images displayed at the top of this page are a selection of different apartments located in the Sitges area. Choose a date and click on an apartment to see the corresponding photos. The hotel’s Àgora Restaurant offers Mediterranean cuisine next to the pool. There is also a bar and summer terrace with views of the sea and promenade. Sitges Train Station is 10 minutes’ walk away, connecting you with central Barcelona in just 45 minutes. Garraf Nature Reserve is 5 km away, and El Prat Airport is a 30-minute drive away. belviaggiodesigns made a real revolution in the industry.